Just before Christmas there was a tongue in cheek discussion on a Facebook outdoor page about trail food. One poster was bemoaning the fact that nobody seemed to eat the classic rucksack staples such as pork pies, Garibaldi biscuits, scotch eggs, malt loaf, etc these days. I joined the discussion stating that Garibaldi biscuits were a favourite of mine because they were very durable but these days due to having to follow a gluten free diet they were off menu. As were the rest of the other items under discussion for that matter. 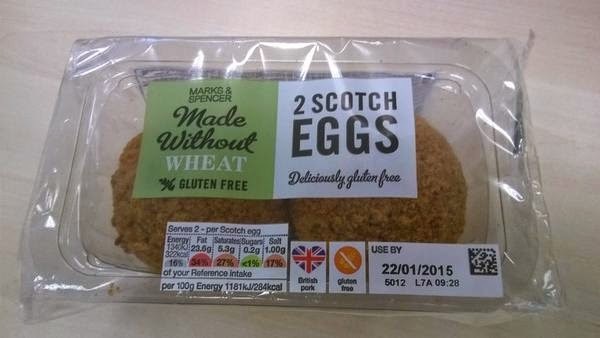 Not long after that I was looking for lunch in M&S and discovered that they now sell gluten free scotch eggs so they ended up in my basket in a flash. Back at the office they were gone before I could make note of the nutritional detail! And they were very tasty, a little drier than I'd like but that's gluten free food for you. A quick warm up would solve that but perfectly acceptable as a lunch when out and about. Since their discovery they have found their way in to my daypack on a number of occasions. As you'd expect from a pork meat encrusted egg fat is high up on the count at 23g per egg (114g each approx) with protein at 13g and carbohydrate at 14g. As you can see with the amount of fat (20%) in it the scotch egg doesn't fit in today's ideal diet but if I'm out and about on the hills in winter these 'fat bombs.' are ideal for bolstering calorie intake, and are far more tastier than some alternatives. This is my third pair in Inov8 Roclites, and these are the new look from last year’s revamp. So what’s changed? Well, the mesh upper is now solid and has a new paint job. Although I’ve been a fan of using running shoes as my go to hiking footwear for a number of years I’ve always avoided the garishly finished makes like New Balance and Asics. The paint job on these is borderline but now with several months wear they aren’t so bright and shiny anymore. The midsole has changed to, it’s more springy than the earlier models as I seem to remember, which is good, meaning more comfortable and less tiring walking. The chunky sole remains which is great as they helped to keep me on my feet when running scree slopes in the Picos de Europa a few years back. And despite the non-mesh top the size 10s weigh less than their marque weight. However the non-mesh top isn’t an improvement on the earlier models, so it’s more water resistant than mesh but isn’t any where near as breathable. Last September when I walked a chunk of the Thames Path my feet overheated whereas with the previous mesh upper Roclites they wouldn’t have. And once damp they took longer to dry, in the past I’ve walked trainers with mesh uppers dry depending on the weather this wasn’t the case with these. My overall view on the revamped Roclite 315s is one step forward and one back, the solid upper will be fine for the cooler months providing they stay relatively dry but I will need to invest in pair of trainers with mesh uppers for the warmer months. One final point, I’ve used Superfeet insoles with all the Invo8 trainers I’ve owned but with the revamp they no longer fit. There must have been a change to the heel cup because first time out with them in my heel pads were pinched badly. Maybe the heel cup has been updated so that insoles like Superfeet are no longer required. I know a number of manufacturers that have been using better designs in recent years to support the heel pads so this may be just another development with the trainer. Not that this is an issue as I’ve already got many hundreds of miles use out of them so am not out of pocket and there still may be need for them with future purchases. 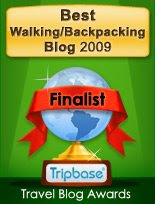 I have to thank fellow Backpackers Club member Darren Long for introducing me to this pitch. I own a BPL Duo Tarp and in the past to give good weather protection I've used a standard three sides to the ground pitch with the opening on the leeward side of the weather as shown below. With this pitch there is a lack of privacy, it’s best to use a bivibag and sleep with your feet towards the entrance for maximum weather protection, and pitched this way gives enough room for two. In the past I've pitch the entrance with the cover of a wall – not the best view but it does prevent prying eyes. However the pitch that Darren introduced me to goes one further and creates a smaller entrance and a beak giving more weather protection and better privacy. 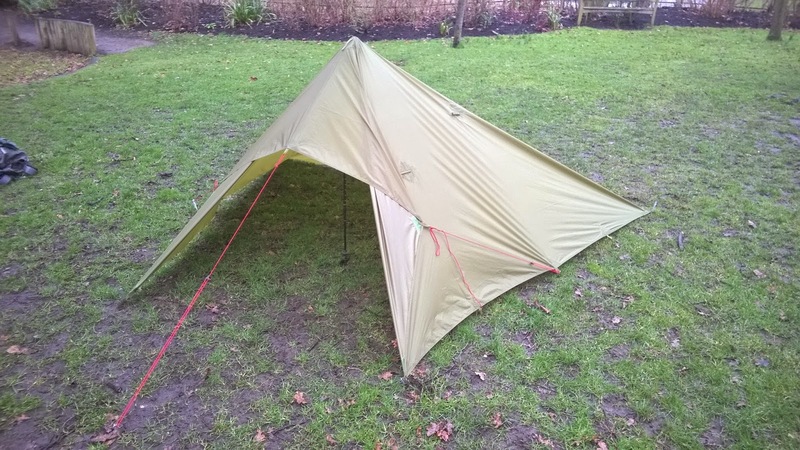 I've called this the Trailstar pitch after the MLD shelter as they are similar in shape as seen here. Pitching is straightforward with the long edge at the back corners pegged first followed by the front. Take each corner and peg in line with the next tab in making sure the edges are tight. Fix a guy to the front middle tab and insert trekking pole under the tarp and guy out (with the Duo Tarp the pole sits under a tab). Then put intermediary pegs on the side and back edges. Take each of the corners and tie back to the peg on the side. Take your second trekking pole and set a riser at the rear to give a bit more room. Pitched like this there is plenty of room for one, headroom is good to at circa 120cm towards the entrance and with the entrance being sheltered you should be able to cook under cover. This was a test pitch and although easy enough to muster, I suggest having a few dry runs at it as I did find I needed to tweak it to get a decent enough tightness to the tarp. Incidentally Darren used bungee tie-outs which would help with this. The instructions I have state that the wings on the sides can be re-positioned, along with the beak, to cover the entrance although I've not tried this yet but it looks a bit of a faff. On a recent meet Darren used an umbrella to block the entrance instead which is a simpler solution. For those that are having trouble following the above there's a link here to a video using a DD 3x3m tarp, the method is the same but the shape is obviously different.